In special reports, this week’s files cover: Flying Saucers Serious Business, Optical and Photographic Technical Component Awareness Part 2, No Decision Yet on East Coast Missile Defense Site Letter from Earth Guardian Susan Signal, Holland Crop Circle in Wheat, and Mars Faces and Dam. Unidentified Aerial Phenomena sightings were reported over: California, Colorado, Georgia, Illinois, New Jersey, North Carolina, Ohio, Tennessee, and Texas. Sightings of UFOs were also reported in: Australia, Canada. Chile, China, South Africa, Turkey, England and Scotland in the United Kingdom. While I was in Vietnam in 1968, the US Air Force modified the weather! I suggest that a few airplanes could modify the strong storms we are having causing tornadoes and high winds. People who knew Wilbur Smith claim he was in contact with extraterrestrials and was provided some data on how the propulsion system operated although our technology was too primitive to duplicate the craft. The matrix had great numbers – thousands – of 15-micron spheres scattered through it. He returned the piece to a special group much higher than the Air Force. He also stated the Canadian government had recovered a large amount of unknown metal from a craft that crashed about 3000 pounds of it. If the remains of the crashed craft are not in the hands of the military, they can justly claims they have no evidence. Saucers Are Serious Business Pages 49-50. On June 25, 1952, Smith submitted an interim report on Project Magnet in which he stated that, “It appeared evident that flying saucers are emissaries from other civilizations and actually operate on magnetic principles, that we have failed to grasp due to our not paying enough attention to the structure of fields in our study of physics. Bremner arranged an interview with Dr. Robert Sarbacher, an electrical engineer and guided missile scientist with an impressive background, but most importantly, who was then a consultant to the U.S. Research and Development Board (RDB). In the interview on September 15, 1950, Sarbacher was to tell Bremner/Smith that Scully was essentially correct, flying saucers existed, they didn’t originate on Earth, and the subject was the most highly classified in the U.S. government, at a level higher than the H-bomb”. Note: These small spheres may be like the orbs frequently seen today. They may operate similar to drones sending video back to larger craft. Frank Edwards had insider contacts. Please see Grant Cameron’s website for more details. A very bright Moon may also show a similar rectangular section in “red” or other color as a result of “blooming.” If internal structure is noted in or on an object, the investigator must try to determine if other objects in the same general field of view were in focus when using camera or binoculars etc. Objects in focus near to the witness may be in focus due to camera lens programming and objects in the distance may not be in focus. The investigator must be cautious here. If the witness has observed the “object” through binoculars and states there is/was structure, be aware of the potential mistake of witness information. Sometimes when photographing objects in the sky even the slightest miss-focus may cause structure to appear. All photographs should be inspected for false focus adjustment and must be very carefully evaluated. In 2014 I talked to an investigator in Europe. He saw a perfect saucer with what appeared to be a “cupola” in the video. Upon inspection this object only appeared if the camera was just very slightly out of focus. There have been other instances in past investigations of this nature. Objects near the horizon may cause witnesses to report activity when there is none. When looking through our atmosphere to the horizon or even somewhat above, there are more atmospheres to look through than if one looks straight up in the sky to the Zenith. This thicker or denser atmosphere may “twinkle” more than the rest of the sky. Due to refraction of light near the horizon objects may appear to have color when in fact this maybe just the effect of the atmosphere. Objects may appear to move about in strange ways due to the turbulence of the atmosphere which causes “Scintillation” or “Twinkling.” Astronomers call this turbulence “Seeing” and rated on a scale of 1-10, with 10 being a perfect night for observation or photography. This is why observatories are built at high elevations. (There are other reasons also.) Just be aware of these effects when reviewing cases that include information concerning the elevation of objects in the sky with color(s) and erratic movements near the horizon. NEVER LOOK AT THE SUN THROUGH ANY OPTICAL SYSTEM OR WITH YOUR UNAIDED EYE. The Defense Department has not made a decision on the establishment of an East Coast-based missile defense site, the vice chairman of the Joint Chiefs of Staff said today. Navy Adm. James A. Winnefeld Jr. focused on U.S. missile defense during a discussion on national security at the Center for Strategic and International Studies here. “We want our adversaries to know that not only is there a price for attacking us or our friends,” he said, “but also that the attack may not succeed in the first place, resulting in pain but no gain.”In improving the entire U.S. defense missile system, Winnefeld said a holistic view must be taken to ensure limited resources are “wisely” invested — not just in ground-based interceptors.“In this light,” he said, “there has been a lot of talk about installing an East Coast missile field. However, Winnefeld said, the only reason to make that investment would be to provide the capability to shoot, assess and then shoot again, which can only be done if the sensors needed to do so are in place.“We need to put our ability to see targets at the head of the line, and therefore, there’s been no decision yet by the department to move forward with an additional [continental U.S.] interceptor site though we very well could do that,” he said. I receive a series of letters from people who claim they are walk-ins from other planets. They often hold important positions and one ran a multi-million dollar company using some of his off planet inventions. Susan has memories’ that might interest you. Susan writes, “My experiences started back in 1966-67, when I was 6-7 years old. I was sleeping when I had this dream of flying a ship which entered the Earths’ solar system faster than the speed of light. Due to the very nature of my dream and its implications, I knew I couldn’t tell my mom like any other child tells their mom because of her not believing in ‘spaceships’. So, I was alone on this one and had to sort it out on my own. This was only the beginning of self re-discovery and a long bonding relationship with them. A few days later in 1967, after the recall-reoccurring dream, I had a dream where I was in the mother ship being shown a series of cylinders with embryos in them. There was a couple standing in front of me as three aliens (ovoids-not greys) told me what they were. They also made it clear that I’m one of them and those were my real parents. They explained in great detail just how they did the in vitro method and that this method ruled out my Earth dad as my real father, but not my Earth mom as my real mother. I somehow knew they were my real parents from my past life and felt a very strong maternal bond to both of them. I was in tears and didn’t want to leave the ship. They told me ”Don’t worry you will be with us while you are here, we will always be with each other up in ships, your DNA from your past-life body is you now, we put the past-life body DNA in the Earth mother’s egg and these 2 parents are really your parents from the past-life.” When I heard that I felt real sad like someone stole my life and parents from me. I was also shown the 3 beings that did this. There was also a show of the ethers I was floating around in, in the Earths’ atmosphere when they located my soul. I knew right then that there is such a thing as reincarnation, but again, couldn’t tell my mom because of her beliefs. I would wake up sitting cross legged staring at the closet. As the visits progressed, I was shown the mother ship, my former real people and felt quite at home there. This ship is the main mother ship of our people. Zevenbergen — Nancy Talbott, BLT Research Team Inc. writes, “For several days both Robbert and I had been telling each other we felt a new circle was coming…I thought it would come Saturday night, but it didn’t and on Sunday night at 11:02 pm (Dutch time, 5:02 pm E. Coast U.S. time) Robbert skyped, saying he’d called Roy because he was sure it was coming now”. Roy had arrived when Robbert skyped me and, by then, Robbert had gotten an image in his mind’s eye of what the new grain formation would look like near Zevenbergen. He also “saw” an actual street name this time (Mrenswegje). I got Robbert to hold up his sketch and made sure the clock in his kitchen also showed, so we could demonstrate the day and time. This is a fairly big formation —146 feet. overall and the big center circle is 84 feet in diameter — and it was quite far into the field. When they arrived Robbert “saw” (in his “mind’s eye”) something really big hovering over this field and then knew this was where they should stop. Although it was very dark Robbert somehow picked the right tram-line the first time and, as they entered the field, both men said they felt “something was following them; something not visible was above their heads and watching them that Robbert felt was a UFO. In one of Astrid’s fairly close shots I could see a huge elongation of the apical nodes in one of the STANDING center plants (red arrow), as well as clear bending of the bottom nodes at the base of the center swirl. When Robbert called me after finding the formation he said that as he entered the field he had also felt a “pressure” on his head and shoulders….and then remarked about a “heat” he had felt on his chest—as if the sun, or a heater, was aimed right at his chest. He’s never commented on anything like this to me before. (see BLT report ). As Robbert looked up toward the “energy” Dan’s video camera suddenly began to darken all by itself until its LED screen was almost totally black due to the “energy” present. A woman Robbert doesn’t know who lives in the Utrecht area had emailed Robbert two days before the cc appeared, saying she ALSO had been feeling a new formation was coming…and she actual also enclosed a drawing of what she “saw” it might look like. Apple Report Pt1. The news was reporting a pyramid on Mars, but I do believe that this was just the pinnacle structure of a much larger building that was buried below the dirt or destroyed. There is also a face near the pyramid and two other not far away. The news didn’t report about the faces, so I decided to make my own video to let you know. This week a UFO researcher who goes by the name of Martian Archeology on YouTube found what looks like to many to be a intelligently made water dam. I have to agree, this does look like it held water and I did find signs of some ancient black structures in the photo a little ways away. 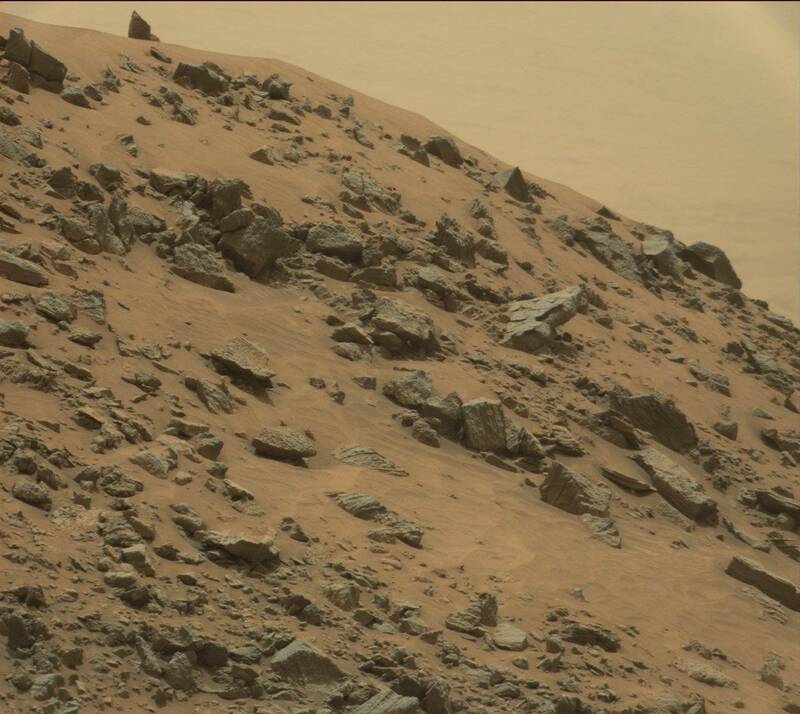 Also I found the face of the species that lived in this area of Mars. The face has a beard and mustache and a face similar to humans, but it’s lost a lot of details over the years. I told you, when you find a face. Ancient Water Dam with Alien Face near It on Mars, June 2015, UFO Sighting News. Marina — My wife took a picture on our way to my son’s baseball game on June 20, 2015, and this object was seen in the picture after we looked at it later. Denver — I was outside in my backyard taking photos of the sky on June 20, 2015. Right next to the Sun was a huge contrail left by a plane flying overhead. Hollywood – I was looking toward the airport or Port Everglades and noticed a funny looking rain cloud. It’s entire length seemed to be moving (shimmering actually) like it was filled with rain and moving and in the process of a heavy downpour, only, the sky was very blue all around and no dark or grey clouds were anywhere close. When I took this shot, I did not notice the soft white glows on the top of the formation, nor did I notice the approaching black rectangular object to the left. Brevard –I was heading into a store. I saw an object moving across the sky on June 11, 2015. I took a picture and went on into the store at 9:49 PM. I told the clerk and he came out to see it, but it was gone. McKinney — I was taking a Morning Prayer walk on June13, 2015, when I noticed the sky open up faster than normal. I took it as an answer to prayer and snapped two pictures. About 5 hours later I pulled them up to show my wife and we noticed a green spot in one of the pics and expanded both pictures and saw the ufo in two positions with different lighting on both pictures. Wheatley, Ontario — I am reporting this sighting for my sister and her boss that saw four white/pink stars like objects in formation on June 9th, 2015, at 10 pm, for about three hours. Three were forming a triangle with the fourth leading. The leading object was the most active, making weaving and figure eight maneuvers. These objects had a physical effect on the surrounding clouds, forming a circle of clear space around the formation. Sometime after the sighting, a FM 96 radio station in London, Ontario (London’s Best Rock) shared a listener’s post on Face book, featuring two photographs of the same formation. Only three of the four objects were sighted at this time. La Raja — A luminous object startled fans enjoying the soccer game at the National Stadium on June 12, 2015. It was crossed the skies over Nuñoa for nearly 3 minutes. It was gone in the same way it appeared. The alleged UFO during the opening ceremonies of the Copa America at the National Stadium was swift and fleeting. The fireworks launched at the sports arena drew the attention of one supporter, who took out his cell phone quickly to capture the moment. However, he never thought he’d find a luminous object moving strangely, from side to side – a movement far from what one would expect of an aircraft. Cape Town — On Sunday night 14th June 2015, I was driving with my son and girlfriend and we saw something like never before three triangular shaped lights in the sky. It was the most amazing sight, in a split second it came together and disappeared so fast. I would like to know if anyone has seen this in Cape Town it was about 8 pm. Thanks to Delia Brookes, Coalition Trading Delia’s Assessing and UFOINFO. I was just taking video of sky and wish to see ufos. And I analyzed my video, so catch these two UFOs on August 18, 2015. Object moved from top to the bottom of image. Plymouth – It occurred to me I should go out and look at the stars on June 19, 2015, and saw an orange orb in the sky. Then it became apparent this was a trapezium craft; with one on the top and another on the bottom: fitted together perfectly. It flashed a series of white (or gold), red and green lights from its exterior, as it stopped hovering and ascended. It flew up slowly staying beneath the cloud level. Dornoch — My wife and I were walking our dog at “Grannies Heilin Hame” caravan site at Embo, on June 1, 2015, when she noticed a white light slowly moving east across the sky at 60° high. I went to my caravan to get my Canon EOS 600D camera and took a picture zooming right in on the bright silent object. I thought nothing of it until I downloaded it onto my laptop and zoomed in. The bright dot became a delta shape and numerous other worm-shaped “craft” are clearly seen around it. I found out later that adjacent to the caravan site is a military practice bombing range. It’s possible that the objects are linked with the exercises or it just MAY be alien craft checking out the area to see our defenses. 2) Video Links: It’s further confirmation that repairing the Telomere gene is the key to reducing the impact of aging and diseases of all types. To order at wholesale prices please call Donna at 207-409-2665 or [email protected] for ordering at wholesale prices.